Deckadence flooring, anyone using this? We love ours. It took a little bit to get used to under foot as it's not nearly as soft as carpet. All that being said we don't think about it anymore. It sticks to the floor well without snaps. It does not move around at all. No matter how much water is in the boat you not slip. Most debris seems to pass through to the floor underneath. You can take it out and hose it down to clean it if needed. Let me know if you need any other questions answered. I specifically did not order it because it didn't snap in. If I had to go back and do it again, I would have not ordered anything and bought the Seadek kit. I went with the Aqua fusion mat. How does it seem to be wearing? How many hours on your boat now? My dealer has no boats with it. Imo, even Malibu carpet really does not feel that great either once it gets matted down. Feels good for about the first 30 hours then it just changes quickly. I did not care for the aqua fusion because it feels more abrasive and hard on the feet when I walked on it. Not really too many other options. Demoed an LSV with it last season. Did not like. Slid around, rough on the feet, and gave the boat a cheapened feel. ^^^ Man that stinks, not a great review of it. Looks like I might be sticking with the oem carpet, I just wish it would hold up a little better. Its not awful but definitely not a high grade carpet they are using. I'm sure you know from other post I've had the Deckadence and recommend it, everyone who got in my boat commented on how much they liked it also. I had it in from day one...put 70.1 hours on the boat and it never came out the whole season, looked like new the day I sold the boat. It did not move around, was easy to maintain (did nothing to it), felt great to the feet, but will admit similar to carpet or the aqua mat it could get hot. The difference was it was so porous that when the boat gets moving it immediately cools off. Just a thought, it may not have moved around because of the snaps left in the flooring? Anywho, I like to try different things and this year will be running the SeaDek faux teak flooring. Since my Deckadence was WTW logo custom I would have kept it, but they verified it could not be modified to fit in the new 23 LSV. I don't understand why your dealer cannot order it? I am mostly a lurker here and I own an old Tige 24V. I am surprised by the negativity regarding the Decadence. I am in process of ordering Decadence for my boat (sent template in and waiting to get it back). The darker colors definitely will retain more heat but the lighter colors should not. I ordered samples in graphite, deck grey, and luna silver and tested them in Southern California heat (about 90 degrees) and the graphite (same color as my oem carpet) got the hottest, deck gray was about the same temp as my carpet and the silver was likely less hot than the dark gray carpeting my boat has. The Decadence also got noticeably softer when warm vs cold. I would NOT get the Graphite color, it will get hotter than carpeting of a similar color. When I was in a heavily listed boats with snap in carpet, the snap in carpet shifted more than the Decadence did. Either way, I HATE my glued in carpet. On my boat for some odd reason I get snap out carpet in the bow walk through and glue down carpet in my cockpit. If you are thinking about Decadence, I would recommend getting the sample colors. I thought I liked the Deck Gray color on the website but in person I preferred the Silver. Hope to have mine in a couple weeks. Also, my understanding is that Decadence will not sell direct if its available through a dealer. You may find pricing is less if you order direct vs a dealer if your pattern is not one that has a dealer exclusive. I'm surprised by the negative reviews too. I've heard nothing but good things from others. Seems like it is a love it or hate it scenario. I strongly recommend anyone demo it before buying. What is your feedback on the Aqua Fusion mat? Fman, are you sure you are not confusing the Tatami mat with the Aqua Fusion mat? The tatami mat is abrasive for sure, I've walked on it. I haven't seen the aqua fusion in person, but it doesn't look abrasive from pictures. You are right, my bad, I think I am confusing the Tatami mat with aqua fusion mat. Does aqua fusion have a website? Malibu will not let my dealer order the deckadence for my 13 VLX because it was ordered with oem snap out carpet and they did not offer it until 2014. It's a bogus ploy from Malibu, but really no surprise, they want you to order a new boat for any type of upgrade on a product. However, I did send a email to deckadence today and got a reply back that in June deckadence will allow the dealer to order direct from them. I think I will start with some color samples from deckadence. I'm really hoping to see it in a boat and walk on it, that would give me a better idea of how it is. I'm a little confused on the feedback on it, some love it and others want nothing to do with it. Better get your order in quick. This thread may put a swift end to Deckadence's cooperation. The Deckadence I had was Luna Silver with a black logo, I wouldn't get any darker. 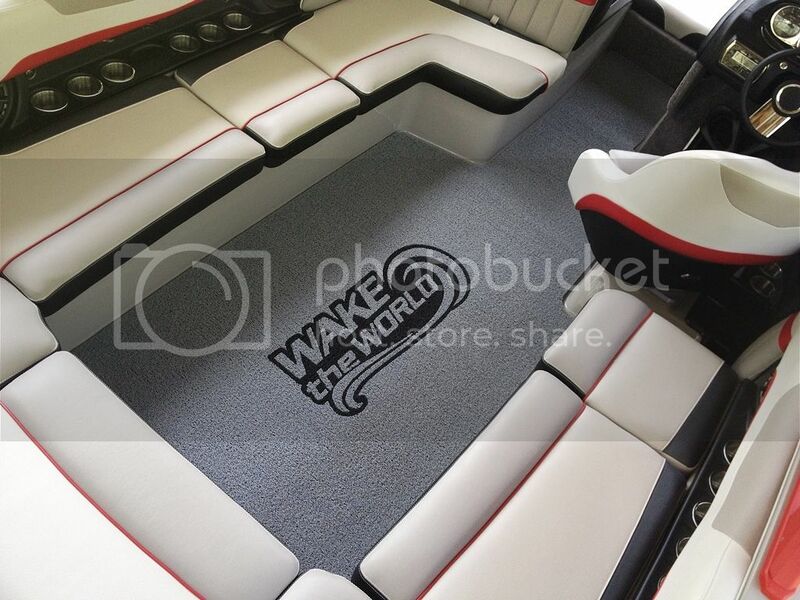 FWIW, I sold the boat with both this mat and a Aqua Fusion mat and new owner is using the Deckadence. Eddie, it sure looks nice in that picture, I just need to find someone local to me who has it in there boat. Fman- have you 100% ruled out Seadeck? Have you seen the LSV photos with it? ZERO negative reviews from anyone who has owned it. It is okay. I mainly got it because we will have kids on the boat. It won't stain,and can easily be washed. Not soft on the feet, but not awful. Like I said, if I were to do it again I would not order flooring and buy the Seadek kit. I have considered looking at it, but I have a hard time with permanent flooring in a boat that will not come out. I like to be able to remove the carpet and give it a good cleaning, this would be my biggest concern with Seadeck. And its glued down, not sure what the longevity will be, if you ever needed to replace it man that would be one heck of a project tearing it out. And the price of $1,600 seems insane to me for a small area of flooring,. 70 hours and it looks brand new.